Anchorage has roughly 122 miles of paved trails within its city limits. Considered one of the most beautiful trails in the nation, the Tony Knowles Coastal Trail is an 11-mile-long paved trail that runs along the coast between downtown Anchorage and Kincaid Park. Moose, eagles, beluga whales, and Mt. McKinley can be spotted on or seen from the trail, creating a wilderness-meets-city experience. It is a remarkable trail loved by locals. 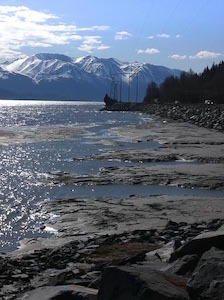 The panoramic mountain views of the drive down Seward Highway along Cook Inlet create an intimate sense of adventure. There are a lot of nooks and crannies to explore along this drive with the potential to see beluga, mountain sheep, eagles, and much more. 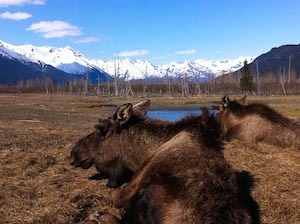 If you want to view and give back to Alaska wildlife, stop in at the Alaska Wildlife Conservation Center (AWCC). AWCC’s mission is to educate, and to conserve and provide quality care for injured and orphaned Alaska wildlife. Here you will see everything from bears, moose, and caribou to wood bison and muskox. It is located at mile 79 on Seward Highway. If you don’t have a car because you are on a tour, see if you can rent one for the afternoon. The drive down to AWCC and the Center itself is worth the trip! 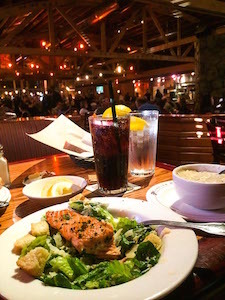 Anchorage has a plethora of excellent restaurants, but if you want to have an elegant and authentic Alaskan eating experience, try Glacier Brewhouse. Glacier Brewhouse is located in downtown Anchorage and is popular with tourists and locals alike. Their fish is locally caught and their beers are brewed onsite. The atmosphere is rustic and their food is delectable. Reservations are recommended. Alaska’s history and culture are rich and complex. A great place to gain a better understanding of Alaska and its people is the Anchorage Museum. The Anchorage Museum is located in downtown Anchorage in their newly renovated building. Their exhibits include local history, local and visiting art collections, an interactive science center, and the Smithsonian Arctic Studies Center, an exhibit that contains hundreds of indigenous artifacts on loan from the Smithsonian Institute. There are many shops located in downtown Anchorage that can fill any tourist’s need for souvenirs. But if you want a unique souvenir shopping experience, check out Alaska Wild Berry. Alaska Wild Berry is known for their Alaska chocolates, jams and jellies, meats, smoked salmon, and cheeses. They also sell T-shirts, gift baskets, jewelry, and other souvenirs. 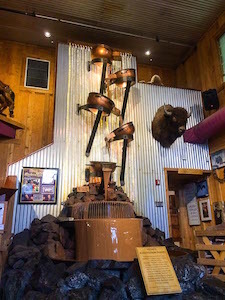 The main store and factory is located on 5225 Juneau Street and houses the world’s largest chocolate fountain. There you can have tastes of their elegant chocolates and watch them make these scrumptious treats. During the summer they have music, dancing, and other entertainment. So if you are planning a trip to Alaska, make sure to enrich your trip with a day or two exploring Anchorage!